Bolton may seem like the average town, but when it comes to paranormal activity it is incredibly active. There is a wide selection of haunted places to choose from including a number of haunted pubs, a theatre and stately homes. 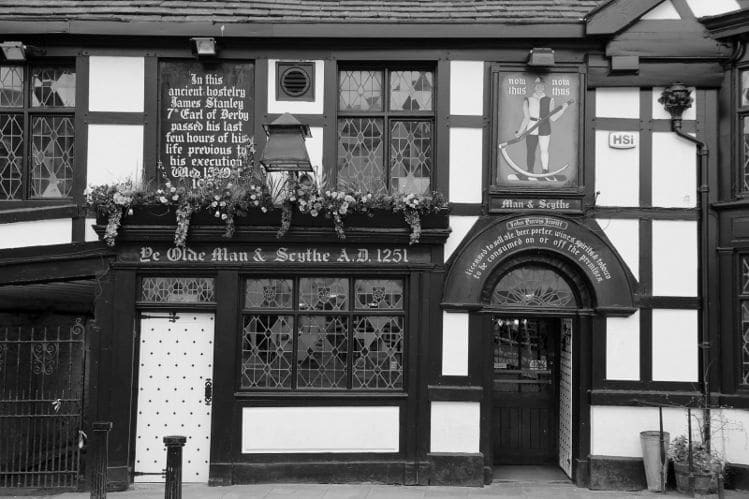 Ye Olde Man & Scythe can be found nestled in Bolton’s town centre and you can tell instantly from your first glance at the building that this place is old! In fact, time seems to have stood still for the world famous cider house to the extent that it actually looks totally out of place today! Needless to say, Ye Olde Man & Scythe is one of the most haunted places in Bolton! This is the fourth oldest pub in the whole of Britain and it is every bit as famous for its resident spooks as it is for holding that title! 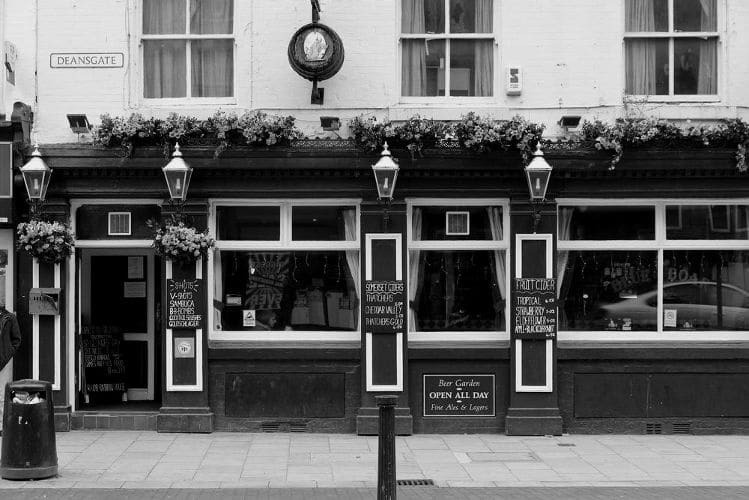 There have been several different ghost reported at Ye Olde Man & Scythe over the years, but perhaps the most famous one is the spirit of the seventh Earl of Derby who was actually beheaded right outside the pub! He has been spotted in several spots around the pub. He is certainly not alone, as the pub is alleged to be haunted by no fewer than 20 restless spirits! There have even been reports of poltergeist activity! In 2014, the bar manager came downstairs to find broken glass all over the floor. Fearing a break in he retreated to the office to view the CCTV footage only to see glasses flying off of shelves and smashing with nobody in sight! Another pub that the Bolton ghosts like to call home is The Blue Boar, which actually stands very near to Ye Olde Man & Scythe. 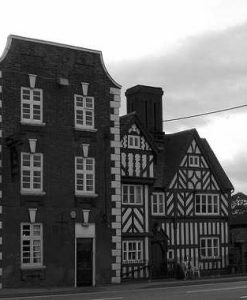 Like the pub already mentioned above, The Blue Boar is reportedly haunted. In fact one local paranormal investigations team has dubbed this the most haunted pub that they have ever had experience of! Just some of the paranormal activity that has been noted within The Blue Boar includes banging noises coming from an empty, sealed room and pint glasses being knocked right out of customers’ hands by unseen forces! 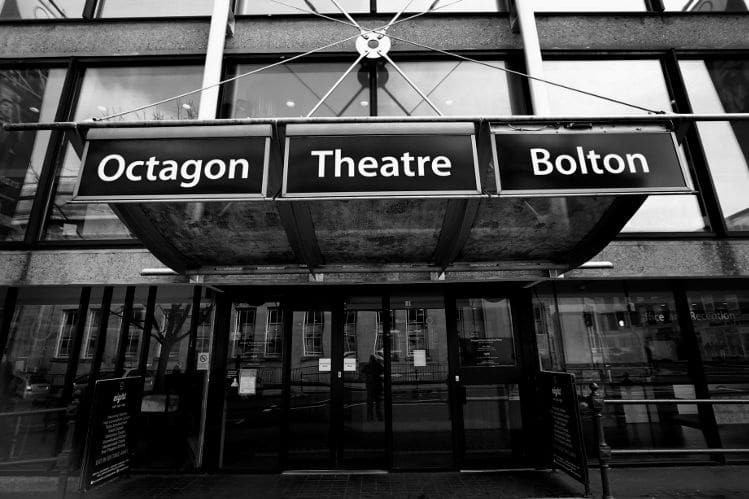 Bolton’s Octagon Theatre first opened in 1967 and for several years it has been regarded as one of the most haunted places in Bolton. The Octagon Theatre has its own resident spirit called Fida. The story goes that Fida was the very first wardrobe mistress at the theatre who passed away while she worked there. It seems that she has never left the theatre and from time to time sewing machines will come on of their own accord and an apparition of Fida has also been seen in several different locations around the building. Hall’i’th Wood is a little bit of a hidden gem. 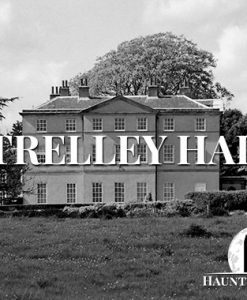 The name translates to ‘Hall in the Woods’ and these days it is surrounded by a modern housing estate which makes it look incredibly out of place! It was built back in 1648, but records show that there was most likely another building which stood on the same site prior to this. Hall’i’th Wood is probably best known for being the home of Samuel Crompton, inventor of the spinning mule, but it is also gaining a reputation as one of the most haunted places in Bolton. Some of the strange occurrences that have been reported by visitors to Hall’i’th Wood include phantom footsteps, white mists and even full apparitions. However, the most common reports say that children who visit often run out crying saying that ‘Betty’ shouted at them and told them to leave! It is not clear just who this ghost named Betty is or why she doesn’t like children coming to visit! One of the most interesting places in haunted Bolton is probably Bolton Priory and its surrounding grounds. 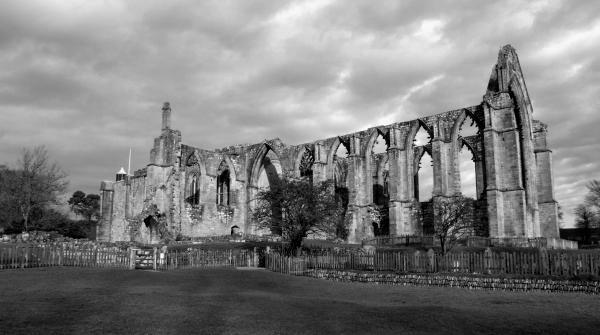 It is sometimes referred to as ‘Bolton Abbey’, but this is not accurate, the building is a priory built in 1121. The actual construction of Bolton Priory took about 350 years having been interrupted by various things including invasion, disease and bad weather! However, by the time of Dissolution it still was not complete and the West Tower was never finished. These days only the foundations of the outhouses are visible and the octagonal Chapter House is long gone, although the arched entrance does remain. Prior Moone continued to use the priory as a place of worship after the period of Dissolution and the nave was secured for this purpose. As is common with the ruins of such buildings, Bolton Priory has tales of a ghostly clergyman! 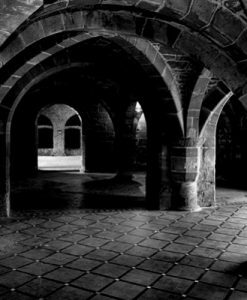 The entity that haunts Bolton Priory is known as The Black Canon. He has been seen on multiple occasions by a wide variety of people over the last few years. He is described as appearing as a man in his late sixties with a weathered face lined heavily with wrinkles. He has several days growth of grey stubble on his face and is dressed in a black cassock, black cloak and a flat black hat. The most common places for him to be sighted are in the priory grounds the choir and in the church. There have also been frequent reports of the sound of sandal clad feet walking in the rectory! There has been some kind of building occupying the land where Smithills Hall now sits since the early part of the 13th century. 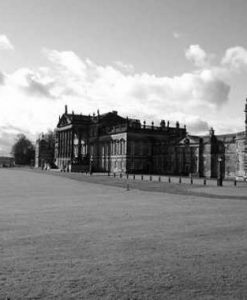 Over the years a handful of influential families have been linked to the property including the Radcliffes, the Ainsworths and the Bartons. There is little information to be found about the Radcliffes and the Bartons other than the fact that the Radcliffes were present at both the War at Agincourt and the War of the Roses and that they were firmly on the side of the Lancasters. However, there is a great deal more information about the Ainsworths. Richard Ainsworth purchased Smithills Hall in 1801 when the family had accumulated considerable wealth during the Industrial Revolution as a result of their success as bleachers.. Richard’s grandson inherited the building in 1870 and engaged the services of architect George Davy to remodel some of the 16th century parts of the building in order to add some additional wings to what was already a sprawling building. Nigel Ainsworth then inherited the hall in 1926 and later sold the property to Bolton Council in 1938 for a reported £70,000. In 1963, the council opened up some of the oldest parts of the hall as a musuem while the remainder of the building served as a residential home and day centre. These days Smithills Hall serves a variety of purposes as a museum, restaurant, wedding venue and of course, a paranormal hotspot! 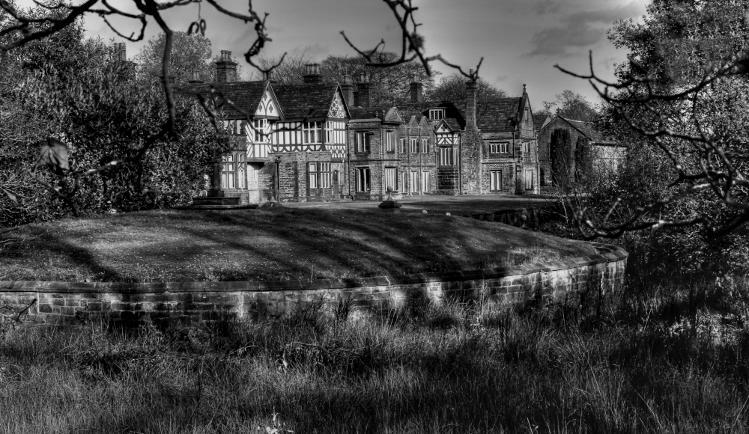 As you have already seen, Smithills Hall has a substantial amount of history surrounding it, so it should not come as a great surprise that this is one of the most haunted places in Bolton. If the reports are anything at all to go on, then this is a hive of strange occurrences. 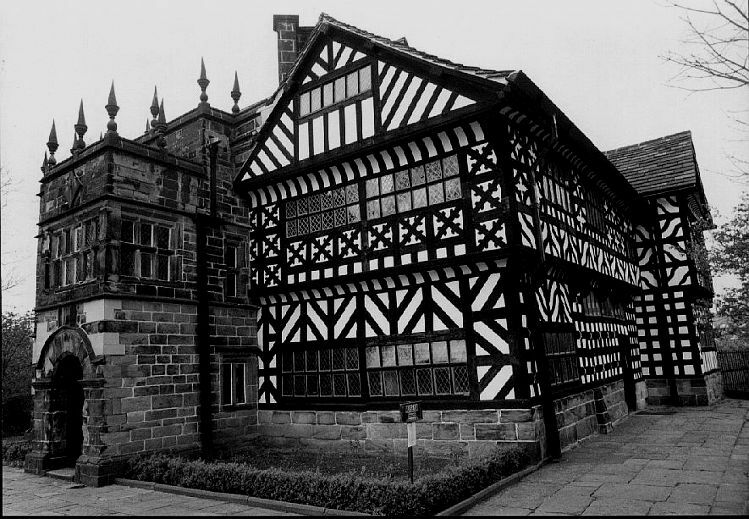 There are a large number of different Bolton ghosts who are believed to call Smithills Hall home. A mischievous spirit has been known to pinch staff and visitors on the bottom and people frequently feel themselves being touched by unseen hands close to the stairs between the Bower and Solar rooms. There is also a lady in period dress who is seen walking on the stairs and visitors often smell burning wood. The Solar Room also has the spirit of a little boy with long black curls who is called Tommy and occasionally he is joined by a young girl. There are also reports of Royalist soldiers passing by the windows outside the withdrawing room who are believed to be linked to the Civil War. Over in the church there is a grey lady who tends to sit in one of the front pews and a second spirit has been seen kneeling at the altar. One of the most interesting paranormal tales that is linked to Smithills Hall is linked to George Marsh, a local curate who was tried in the court room and sentenced to death at the stake. It is said that Marsh left a footprint in one of the flagstones on the way to the room in which he was held. At some point the marked flagstone was removed by one of the residents. However, as soon as it was removed there was a huge increase in poltergeist activity which eventually prompted it to be returned, albeit facing the wrong direction! Now there is said to be a malevolent spirit in the room and many people simply refuse to enter the room!